I have over many years spent much time engaging with my people and listening to their stories of their challenges and their concerns. In particular, I have spent time with school headmasters, school board members, teachers, and students and their parents throughout the Rai Coast District. I have witnessed and received first-hand information on hardships faced by teachers and students, I have seen the deteriorating education infrastructure, I have seen how the O’Neill Government’s tuition fee free education falls short of its lofty goals and I hear disheartening reports as well of school funds mismanagement by school Boards and even by the school teachers. In the most remote schools in the Finisterre Ranges, there is considerable hardship faced by teachers. These schools can take a full day’s walk to reach from the coast. For the Nayudo Local Level Government (LLG) it takes 2 days of walking to reach these schools. 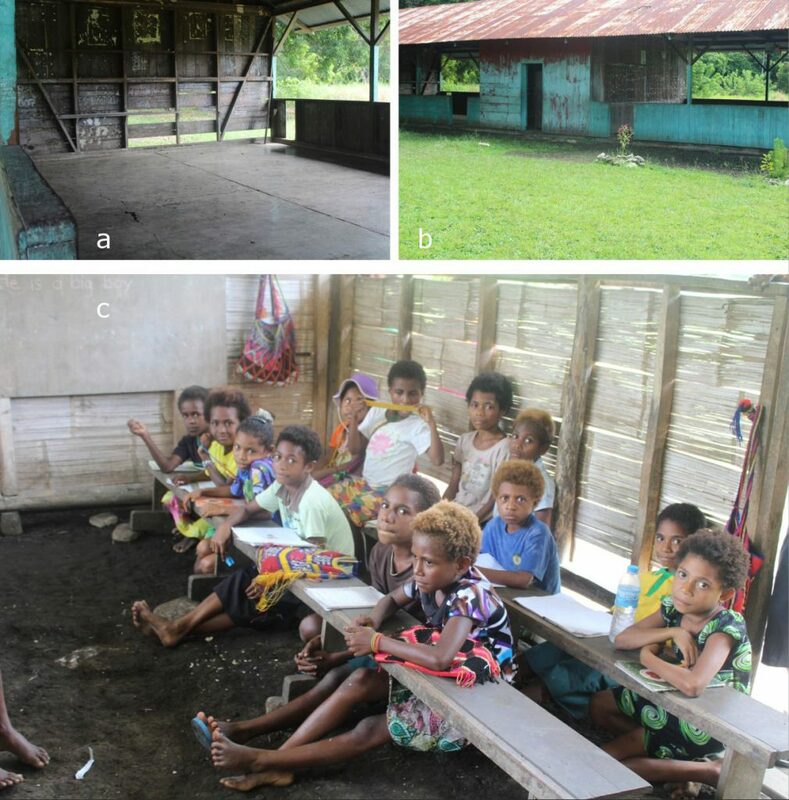 Due to remoteness of many communities, teachers that are from other parts of PNG don’t stay for an extended time. The loyal, long-serving teachers are those that are from our own District. The commitment to serve is often inspired by a deep love and strong patriotism. My people must carry school materials over rugged mountains and difficult terrain for these schools. Sadly, when parents don’t assist or when school management is poor, these schools often close. Basor Primary School is a 4-hour walk from the coast. There is also a logging track that goes to the school, but is overgrown with bushes in some areas. 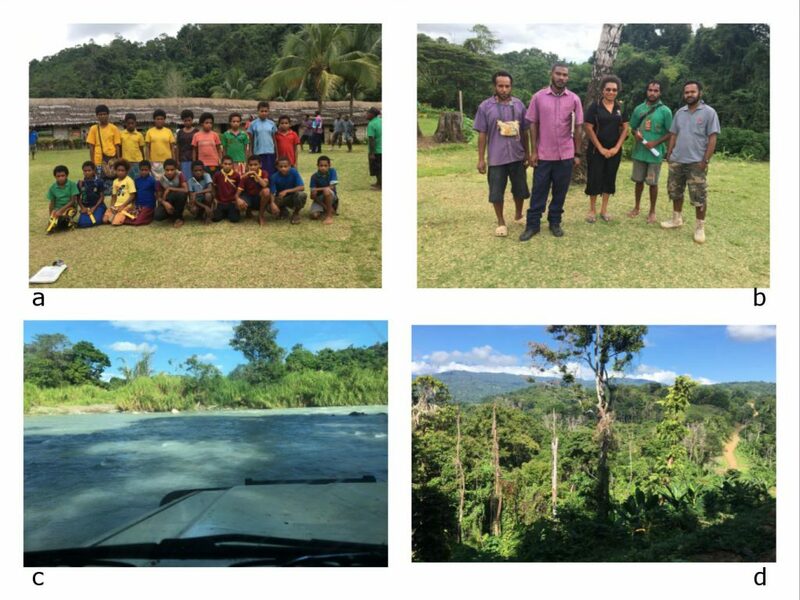 I arrived with my travelling group at Singor Bay and called into the camp of a Malaysian logging company and requested for assistance with transport to the school. Initially unwilling the company eventually assisted. Panel a of the picture shows Grade 3 and 4 students, with their only double classroom in the background. Panel b shows three teachers (in front) and one Grade 8 student (in the green shirt) and myself. I took these pictures in June 2016 when I visited the school and spoke with students, teachers and the school board of management. I went at the request of my cousin brother Mr. Keluo Dou who was the head master of the school. Panel c of Exhibit 1 was taken while crossing the Yangdar River on the so-called Rai Coast National Highway, now a bush track from the lack of maintenance. A bridge that was built over this river by my late father William in the 1980’s has fallen into a state of disrepair and is no longer passable. Panel d is a shot of the logging track that can be followed to reach Basor Primary School situated up in the mountains. In Basor, they need permanent classrooms to replace the ones built with bush materials. Their teachers’ houses are also constructed with bush materials and permanent houses are needed. Usually, the good experienced teachers prefer schools located closer to urban centers or those that impose minimal hardship so young graduate teachers are sent to the remote schools with tougher working environments. These teachers have the zeal and enthusiasm of the young and will learn in time from the invaluable experience that is necessary to deliver quality teaching. These young graduates start on an entry-level salary. The O’Neill Government’s planned real reduction in their wage income compounds the challenges they face when posted to remote rural schools. 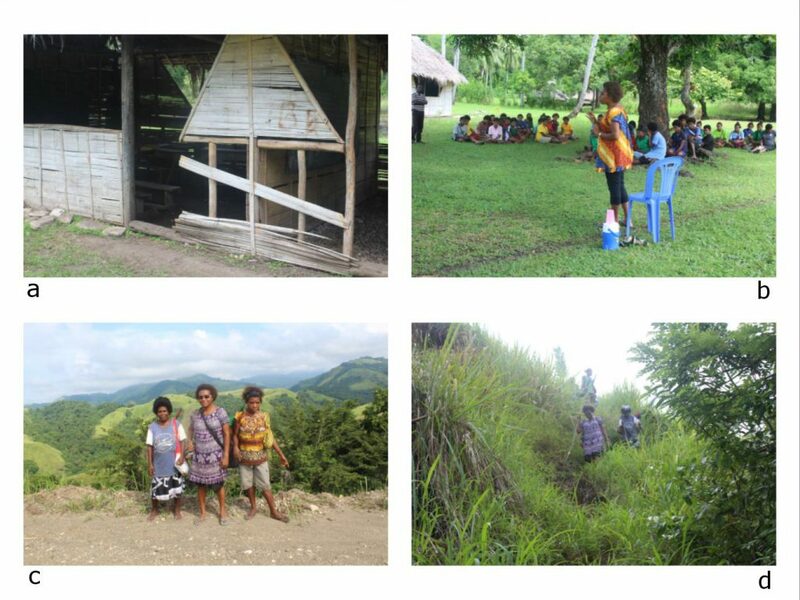 Reite Primary School is a 3-hour walk from the Coast, just across the Yakai River from Basor Primary School. I visited Rai Coast leader Papa Peter Nombo at Reite Village and spent a night in the village as I was invited to speak at the school Parents and Citizens Association (PCA) meeting but ended up addressing the village and students as well who wanted to hear me speak. The classrooms were once quite run-down and were built with bush materials infrastructure as seen at Basor. However, over the last 5 years, the school has been transformed under the leadership of the School Board Chairman Paul Kami. 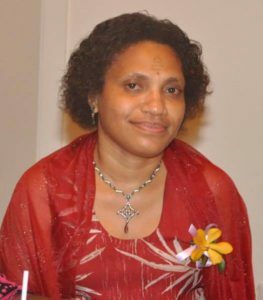 Through his strong connections with the current Madang Provincial Governor Jim Kas he was able to secure financial support for the school. All the infrastructure and equipment in the school were funded by Kas from his provincial discretionary funds and not by the Rai Coast Parliamentarian James Gau’s DSIP (District Support Improvement Program) grant. As a result, unlike Basor Primary School, all the classrooms and teachers’ houses are permanent buildings. They have lofty plans to build classrooms for science and home economics as well as a computer lab classrooms and to equip them. They want solar panels for the teachers’ houses and classrooms. They also want telecommunication connections. I came away inspired by their vision. The school materials usually arrive at the school by foot or otherwise by tractor if the feeder road is in good condition during the dry season. Reite is a model school for inland schools. It has over 300 students and 12 teachers. Although they face challenges, it is the resilience and the strong leadership of Paul Kami with his Board of Management and the young school headmaster Jonathan Zorro who all recognized the importance of strong political support in making a real difference for the school achieving better outcomes. Community pride and a fervent desire to support their school has enabled it to become a leading school in my district. Panel a: With my team on our way to Reite Village. Panel b: A parents and teachers meeting at Reite Primary School. Panel c: Reite Primary School teachers’ houses in the background and timbers stacked awaiting use for a new teacher’s house and another double classroom. Panel d: With leaders of Reite Village. Pangpang Primary School started in 1962. It is one of Rai Coast’s oldest schools, a Catholic agency school. I visited the school at the request of Mr. Paul Ruprup, a teacher. The Senior Teacher Mr. Philip Uyaku, requested me to speak to the students, “to motivate them to be like you”. The school has 5 teachers, 104 students and enrolments for Grades 3 to 8. Pangpang is another sad story of a poorly-managed and rundown neglected school. The Board was ineffective and the Chairman of the School Board misused the school funds. Due to low student enrolments, the school doesn’t get much Tuition Fee Free funding as well. Panel a: Pangpang Primary School Students sit on this floor in this debilitated classroom to learn. Panel b: This is a rundown classroom that was built by the Catholic Church in the 1970s. Panel c: These beautiful children sit on the ground in the classroom to learn. Panel b: I was asked to address students and to motivate and encourage these young children to have dreams and goals, and that with hard work they could achieve them. I spoke about discipline and to obey their parents and teachers and to never look down on themselves. I shared with them my stories of my humble beginnings in my village and my progress in life. Panel c: The woman on the left is Augusta Ruprup. Panel d: Augusta and I walking the small track on very steep mountain side. So steep that I had to use a walking stick for support. I walked the mountains with Augusta Ruprup. 2017 is the 31st year of her husband Paul Ruprup serving as teacher in the inland remote schools of Rai Coast. The couple are devout Catholics and have taken the call to educate children in the hinterlands of the Rai Coast district as their calling by God (“wok misin”). I spent a night with the family at their home in Serieng Village. From there we walked the kunai mountains, across the Mod River to Pangpang Primary School where her husband now teaches. Augusta told me stories of how she leaves her cargo in one school and moves to another because she is unable to carry whatever personal belongings they have from school to school in the mountains. “Sampla kago blong mi stap long Saidor Station. Mi no save, ol man mas stilim ol pinis. Kago blong Ayawang mi lusim long hap. Blong Basor mi lusim long hap. Nau mi lapun na sukuru blong mi tu bagarap. Hat long karim ol kago na wokabaut long maunten”. Far from urban centers and without a road network nor operating airstrips, the teachers serving in remote mountain schools are forced to walk carrying their personal effects and even school materials. Where there is strong community support and school management, the job for the teachers are a little easier but still challenging. Without support most teachers leave and the schools close down. Solutions by a few teachers like Paul Ruprup is to group together 2, 3 or 4 grades and teach them. When we arrived at Pangpang, Augusta’s knees had swelled. I gave her Moringa oil to rub on her knees. She also had malaria but we had no medicine and all I could offer was panadol. She is soft-spoken woman with a beautiful soul and has sacrificed much to support her husband in their “wok misin” . Rose is a young, vibrant, outspoken teacher from Teptep Primary School, in the Nayudo LLG in the Finisterre Ranges. She tells me that it takes 2 days to walk to reach the coast, on the border of Madang and Morobe provinces. From there, one takes a boat, with a fare of K100, to reach town. Teptep has an airstrip as well. It costs the teachers K450 for an one-way airfare. She said “tam mipela ol tisa kam long taun lo balus long kisim pei blong mipela, mipela peim K450. Olgeta pei blo mipla long wanpela fotnait em go. Mipela mas stap lo taun 2 weeks long baim balus na go bek”. Rose is a promising young teacher on entry-level salary. She visited me at my home and told me how she is a champion of gender empowerment and women leadership in her area – she often conducts awareness training on this. She has been accepted to do a Bachelor of Education at Divine Word University through the Flexi Learning program but due to lack of funding for school fees, she has had to defer her studies until the second semester of this year. She expressed her hope that that the government would not only look at paying school fees for the young children but also for more teachers like her so she can get good quality education to serve remote rural schools. I find it uplifting to see passionate goal-oriented young women like Rose focused on bringing development to rural PNG. *Making decisions with the insight of the places is proactive and appropriate. You are on the right track…God Bless. You are truly a champion for your people. You are a great woman leader. I fervently pray to our Lord and Provider Yeshua for his mercy and grace upon you in this endeavor. In His name you be declared the MP for Raikost. Amen.